OutKast is a popular and successful American hip hop duo based out of Atlanta, Georgia. Their original musical style was a mixture of Dirty South and G-Funk; since then, funk, soul, electronica, and rock elements have been added to the mix. The duo is André "André 3000" Benjamin (formerly known as "Dre") and Antwan "Big Boi" Patton, both from the Atlanta area. OutKast is currently one of the two most successful hip-hop groups of all time (the other being The Fugees), having sold 20 million copies of their six releases: four studio albums, a greatest hits release, and Speakerboxxx/The Love Below, a double album containing a solo album from each member of the group. Speakerboxxx/The Love Below is one of only three hip hop albums to go diamond, the other two being MC Hammer's Please Hammer Don't Hurt 'Em and The Notorious B.I.G. 's Life After Death. Benjamin and Patton went to Tri-Cities High School together in East Point, Georgia, and battled each other lyrically on a regular basis. They eventually teamed up, and were pursued by Organized Noize, a group of local producers who would later make hits for TLC and Xscape. OutKast, Organized Noise, and schoolmates Goodie Mob formed the nucleus of the Dungeon Family organization. OutKast signed to LaFace Records in 1992, becoming the label's first hip hop act and making their first appearance on the remix of labelmates TLC's "Ain't 2 Proud 2 Beg". In 1993, they released their first single, "Player's Ball". The song's funky style, much of it accomplished with live instrumentation, was a hit with audiences, and "Player's Ball" hit #1 on the Billboard Rap Chart. Their full length debut, Southernplayalisticadillacmuzik, was issued the next year; follow-up singles included the title track and "Git Up, Git Out", a politically charged collaboration with Goodie Mob that was later sampled by Macy Gray for her 1999 hit "Do Something". On this early material, both Benjamin and Patton contrast lyrical content reflecting the lifestyles of pimps and gangsters with politically conscious material commenting on the status of African Americans in the South. OutKast won Best New Rap Group at the Source Awards in 1995. ATLiens was OutKast's second album, released in 1996. The album hit #2 on the US album charts, and helped the group earn more recognition among East Coast hip hop fans in the East and West coasts, many of whom usually panned southern hip hop artists. "ATLiens" was the group's first Top 40 single, and reflected the beginning of Benjamin's increasingly sober lifestyle: "No drugs or alcohol/so I can get the signal clear", he rhymes about himself. "Elevators (Me and You)", OutKast's first self-produced single, became the group's first Top 20 hit the same year. OutKast's third album Aquemini (1998) also reached the #2 position on the charts; its title was a combination of the zodiac signs of Patton (an Aquarius) and Benjamin (a Gemini). The album was widely praised as an innovative, unique and refreshing album full of hip hop with a progressive vision, both artistic and musically. When reviewed by The Source magazine, it received the much-coveted "5 Mic" rating - the equivalent of a 5-Star or 5/5 rating from another publication. Producing more material themselves, both Patton and Benjamin explored more eclectic subject matter, delving into more innovative sounds inspired by soul, trip hop, and electro music. The album featured collaborations with Organized Noise, funk legend and musical forebear George Clinton, and the Goodie Mob. In 1999, OutKast and LaFace Records were sued by Rosa Parks over the album's most successful radio single, which bore Parks' name as its title. She felt the song misappropriated her name, and also objected to some of the song's obscene language. The song's lyrics were largely unrelated to Parks, save for a line in the chorus: "Ah ha, hush that fuss / Everybody move to the back of the bus". The initial lawsuit was dismissed. Parks hired lawyer Johnnie Cochran to appeal the decision in 2001, but the appeal was denied on First Amendment grounds. In 2003, the Supreme Court allowed Parks to proceed with her lawsuit; the members of OutKast were dropped as co-defendants, and Parks continued to seek action against LaFace and parent company BMG. The suit was finally settled on April 14, 2005, with OutKast not having to admit any wrongdoing. 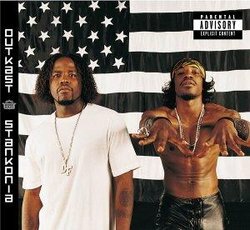 The pair's fourth album, Stankonia was released to excellent reviews in October 2000. It debuted at #2 on the album charts and would eventually go quadruple-platinum. Stankonia's first single was "B.O.B. (Bombs Over Baghdad)", a high-tempo jungle-influenced record. The second single, "Ms. Jackson", was about divorce and relationship breakups, particularly Benjamin's breakup with R&B singer Erykah Badu; the titular "Ms. Jackson" is Badu's mother. The single became their first pop crossover hit, landing the #1 position on the US pop singles chart, and the #2 position on the UK pop chart. The album's final single was the Organize Noise-produced "So Fresh, So Clean", featuring a credited guest appearance from regular guest vocalist Sleepy Brown. All three singles' videos had heavy MTV2 airplay, and OutKast won two 2001 Grammy Awards, one for Best Rap Performance by a Duo or Group for "Ms. Jackson", and another for Stankonia as Best Rap Album. During the recording of Stankonia, OutKast joined with partner Mr. DJ to form the Earthtone III production company, and began producing tracks for the artists on their Aquemeni Records imprint through Columbia, including Slimm Cutta Calhoun and Killer Mike, who made his debut appearance on Stankonia's "Snappin' & Trappin". In December 2001, OutKast released a greatest hits album, Big Boi And Dre Present...OutKast, which also contained three new tracks. One of these new tracks was the single "The Whole World", which won a 2002 Grammy Award for Best Rap Performance by a Duo or Group. The following year, the group and Killer Mike contributed the lead single "Land of a Million Drums" to the Scooby-Doo soundtrack. In September 2003 OutKast released a double album, Speakerboxxx/The Love Below. It is essentially two solo albums, one by each member, packaged as a single release under the OutKast banner. Patton's Speakerboxxx is, for the most part, a party record, tempered by more politically-minded tracks like "War". Benjamin's The Love Below is a sprawling and ambitious work that featured only brief instances of hip hop, presenting instead funk and pop music inspired by Prince, Rick James, Sly Stone, and Frank Zappa. Speakerboxx/The Love Below has received what is perhaps the duo's most rapturous critical reception to date; both discs were considered highly innovative and accomplished. The album is also OutKast's biggest commercial success yet, having debuted on the Billboard 200 Albums Chart at #1 and stayed there for several weeks. The album eventually sold over five million copies, and, as double-album sales count double for Recording Industry Association of America certification, the album was certified diamond (10 million units sold) in December 2004. The first two singles from the album(s), which were released nearly simultaneously, were Patton's "The Way You Move" and Benjamin's "Hey Ya!". Both immediately exploded at radio: "Move" initially becoming enormous on urban radio, then later pop and rhythmic, and "Hey Ya" becoming a smash crossover hit on pop, rhythmic, AC, and alternative rock radio then later on urban stations. "Hey Ya!" was also one of the first songs to become a hit on the Apple iTunes Music Store, replacing "Stacy's Mom" at #1 and staying there for months. Despite a fall release, the songs' music videos (which were often aired segued together) became two of 2003's most played on MTV, VH1, MTV2, and BET, both having entered heavy rotation on all four channels at one point or another. The digital video channels, MTV Jams and VH1 Soul also gave both videos the heaviest of play, MTV Jams having played each almost once an hour at their peaks. Together, both singles spent over ten weeks at number one on the Hot 100 singles chart. Concerned with over-saturation, OutKast's next official single was not released until the summer of 2004. "Roses", a track featuring both members from The Love Below half of the album, did not meet the level of success as either of its predecessors, but it became a modest-sized hit on urban radio and the American music video networks. The final singles were André's "Protoype", which was paired with an unusual science fiction-themed video about alien visitors, and Speakerboxxx's' "Ghetto Musick", which featured both members of OutKast and a sample from a Patti LaBelle song. Speakerboxxx/The Love Below won the Grammy Award for the 2004 'Album of the Year. OutKast was one of the headlining acts at the show, and gave two performances: Patton performed "The Way You Move" during a medley with George Clinton & P-Funk and Robert Randolph and the Family Band, while Benjamin performed "Hey Ya" as the show closer. In February 2004, Benjamin's performance, which featured dancers moving wildly around a green teepee in war paint and feathered headdresses, was criticized by the Native American Cultural Center, which called for a boycott of OutKast and of CBS, the broadcaster of the awards show. CBS later apologized. OutKast's Earthtone III recently founded Purple Label, a new imprint to be distributed by Virgin Records. Its first signees were Sleepy Brown and Bubba Sparxxx. The sixth OutKast album, 10 the Hard Way is due October 11, 2005. Intended as a throwback to the Southernplayalisticadillacmuzik days, the album will feature ten songs, all strictly hip hop, and all produced by Organized Noise. In addition, OutKast will be starring in a HBO movie and will be doing a movie soundtrack album based on the movie.